Even though women were admitted to the University in 1880 it took 8 years until the first woman earned a degree, Belle Clement Gunn in 1888. It took even longer for women to have a place to live on the campus. 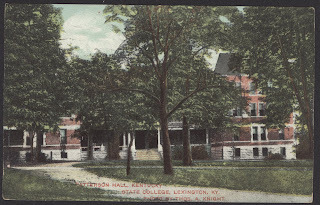 In 1904, Patterson Hall was opened as the first women’s dormitory and the only one built entirely at the state’s expense. It was built specifically as a women’s dormitory and it became the first building constructed off of the main campus. It was originally built for around 125 women which each room to be used by two girls. At the time, the cost of the ground, building and equipment was approximately $60,000. It was named for first President James K. Patterson and in honor of his brother Walter Patterson who sought funding for the building and took one year off of teaching to oversee its construction. At one time, then President Henry Stites Barker and his wife; the dean of women; and the house director all lived in Patterson Hall – imagine living in a dorm with the President! At that time, James K. Patterson was still occupying the presidential residence (this was before Maxwell Place). 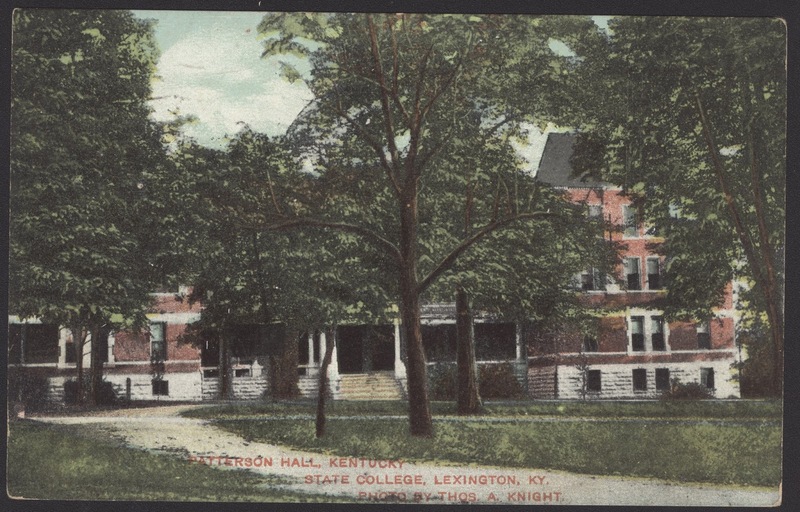 The dorm became co-ed in the 1990s and is one of the oldest building’s on UK’s campus. There is a bit of legend surrounding Patterson Hall. According to an article in the Kentucky Kernel, the Hall is located on an historic site where the first couple in Kentucky was married. John Maxwell and his bride were married in an old block house near the property and then lived in a cabin on the grounds of Patterson Hall. On either side of the entrance to Patterson Hall was a ginkgo tree. In China, the ginkgo tree is planted in front of temple gates to keep out evil spirits. The two trees were known as “mama” and “papa” on campus. According to another Kentucky Kernel article, in the beginning of the 19th century, six Ginkgo trees were given to Henry Clay by an unknown Asian man. Clay reportedly kept one tree for himself and gave the rest away, including the two in front of Patterson Hall. Over time, it became apparent that the only female tree among the original six, was “mama.” The demand for baby ginkgos was tremendous because of the style set by Henry Clay, so all of the early Kentucky ginkgos were descendants of Patterson Hall’s “mama” tree. Additionally, “papa” had a sloped trunk which angled toward the ground and this made him the perfect spot for a goodnight kiss. Different legends concerned the development of “papa's” angle. One was that the weight of so many years of goodnight kisses caused “papa” to gradually bend. "Reel to Real: Special Collections at the Movies"